Using sports psychology to improve your tennis performance might be the fastest way to boost consistency in matches for many junior, collegiate, professional, and club players. Your mental game can help you win matches given you have mastered all the strokes. What are the top advantages of improving your tennis mind game? 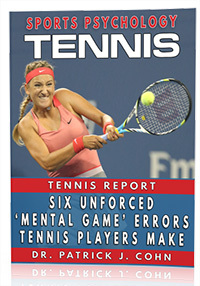 Most players with a strong mental game of tennis can perform as well in matches as they do in practice sets. Inability to play up to your potential in matches is the number one reason players contact me to improve their mental game and tennis performance. Improving your consistency in your match performance – no matter who you play against – is a big advantage due to an improved mental game. You never what your confidence to be based on who you are playing – that’s not true confidence. The ability to stick to your tennis strategy and not change your strategy because of frustration or over-aggressive play. Improve your focus during points so you are able to concentrate on what’s importance and fend off distractions quickly. Help you cope better with pre-match nerves or anxiety during matches. Get the most out of your hard-earned practice by taking your practice game to matches. The ability to cope better with frustration with missed shots, unforced errors or dropped games. Improve your confidence in matches and manage doubts about your ability. 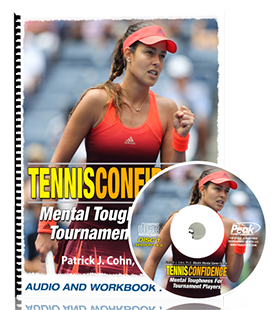 Enhance your on-court trust in tournaments and not forcing or over-controlling your strokes. And any other performance problem caused by your inability to take your practice sets to tournaments. The most critical task during the match is to control your mind and thoughts between points and during a change over. Your attitude between points is very important to your success for two reasons: (1) You have to process each previous point that allows you to have the utmost confidence, composure, and focus, and (2) you have to clear your mind so you can mentally prepare for the next point. Please contact me if I can help you improve your mental game through sports psychology for tennis training.